Is Ethanol Driving Corn and Sugar Prices? With all the buzz about ethanol, some market watchers are predicting an increase in corn futures, while sugar futures are high and expected to go even higher, or maybe not. Market Watch Commodities Corner quotes CKFutures.com analyst Chris Kraft saying, “Corn futures have the potential to explode higher due to increased demand from ethanol production.” Demand for the alternative fuel has already helped sugar prices double in the past six months to trade over 19 cents per pound on the New York Board of Trade — their highest levels since 1981. Corn has a long way to catch up. March corn trades around $2.25 a bushel on the Chicago Board of Trade, a five-month high. High sugar futures caught the attention of the Wall Street Journal this week as well, an article which was critiqued by Elliot Wave International’s Futures Focus. Sugar has tripled in value during the past two years. Prices have doubled in the past five months. They jumped 20% in just three sessions in mid-January. In short, sugar has been rallying. Just in time to explain the move, Thursday’s (Feb. 9) Wall Street Journal includes an in-depth look at this soft market that seeks to explain “Why Sugar Costs More And More.” At the top of their list: Ethanol. … Yet ironically, on the same day that the Journal finally devoted a thorough news story to sugar’s surge, prices for the soft saw their biggest single-session decline in months. Bottom line – who really knows? 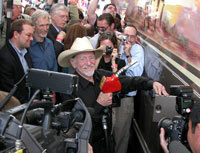 Willie Nelson outshone the other stars at the National Biodiesel Conference in San Diego this week, creating somewhat of an odd media sensation for a city so close to Hollywood. Biodiesel conference blogger Chuck Zimmerman said it was a media circus when Nelson, his wife Annie, and several hundred conference attendees went to Pearson Ford Fuel Depot in San Diego to celebrate the opening of California’s first fulltime “BioWillie” B20 retail outlet. 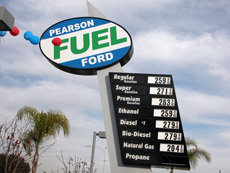 Chuck describes Pearson’s as a “fuel supermarket” offering just about every type of alternative fuel available in one spot. Could be the fueling station of the future. With the addition of California, BioWillie is now sold in four states – including Texas, South Carolina and Georgia. Prior to the Pearson event, Willie wowed the crowd all morning at the Biodiesel Conference – receiving the Eye on Biodiesel Award and participating in a live XM Satellite Radio broadcast hosted by Bill Mack, The Satellite Cowboy. Check out all of Willie’s activities at the conference – with audio, video and photos – on the Biodiesel Conference Blog. Expect the a lot more plants like this one to be built to lessen the ethanol industry’s dependence on natural gas. Archer Daniels Midland has announced its fourth coal-fired co-generation (Co-Gen) plant in Columbus, Nebraska to help power its corn milling and ethanol operations. According to the company release, the plant will be permitted to burn a blend of fuels, including high and low sulfur coals, tire derived fuel and biomass to produce process steam and electric energy. The addition of this Co-Gen plant will help lower ADM’s overall energy costs and lessen its vulnerability to energy market price fluctuations. Co-generation reduces the amount of fuel burned per unit of energy output, and reduces the corresponding emissions of pollutants and greenhouse gases. ADM currently operates similar Co-Gen facilities in Decatur, Illinois and Cedar Rapids, Iowa and has another under construction in Clinton, Iowa. The American Coalition for Ethanol is trying to clear up some confusion in the minds of the public about the term “ethanol.” According to an organization release, ethanol means different things to different people. Because of the way the terminology is used, two misunderstandings frequently arise: people mistakenly believe it takes a special car to run on ethanol and that ethanol is only available at a few gas stations in the Midwest. ACE also has a page on it’s website providing information about cellulosic ethanol for the public. Ag Secretary Mike Johanns has joined the roster of speakers at the National Ethanol Conference coming up February 20-22 in Las Vegas. 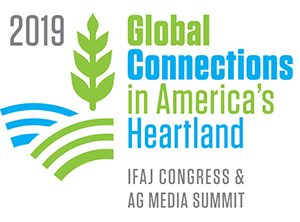 The former governor of Nebraska and former chairman of the Governor’s Ethanol Coalition will speak on Wednesday morning, right after the current chairman of the Coalition Kansas Governor Kathleen Sebelius, and just before the current Governor of Nebraska (and soon to be chair of the GEC) Dave Heineman. That’s what I call symmetry. Expect Johanns to talk about the administration’s commitment to putting more dollars into ethanol research. Ford and GM both used Super Bowl XL to kick off new campaigns with domestic fuel themes. While Ford was turning green during the Super Bowl, General Motors was a curious yellow in pre- and post-game commercials, touting its “Live Green, Go Yellow” theme. GM had planned to launch the campaign today as a tie-in to the opening of the Winter Olympics this week, but decided to ride on the momentum of the President’s State of the Union address last week and take off early. The yellow stands for corn and the campaign is promoting GM’s yellow fuel-filler caps on its E85-capable vehicles to raise consumer awareness, starting March 1. Ford Motor Company and VeraSun Energy are working to create a “Midwest Ethanol Corridor” through Illinois and Missouri to increase the availability of E85 fuel. According to a Ford press release – The first phase in the creation of the Midwest ethanol corridor is to convert approximately 40 existing gasoline fuel pumps in Illinois and Missouri to E85. The move will increase availability by approximately one-third this year. Ford estimates there are 50,000 owners of Ford flexible fuel vehicles (FFV) in Illinois and 28,000 in Missouri. Ford will work with fuel providers and officials in other states to further develop the Midwest ethanol corridor. Here is a link to the MCGA release, and a link to the MU Commercial Ag Program page where you can find the study in PDF format. The CEO of the National Corn Growers Association was in Japan last week to talk about the history and the future of ethanol in the United States. CEO Rick Tolman attended the Japan Biomass Ethanol Fuel International Symposium in Misasawa, Japan – according to a story on the NCGA website. 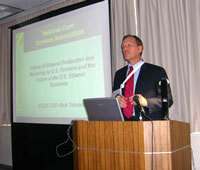 Tolman said Japan has many renewable fuel advocates. Japan recently passed a law that allows a 3 percent ethanol blend in some vehicles. The nation has one ethanol plant that produces ethanol from sugar. Tolman said Japan is looking for ways to increase value-added opportunities for its rural communities, just like the United States.